Automotive brand Toyota has unveiled its new 'Wave' experiential retail space in Abu Dhabi. 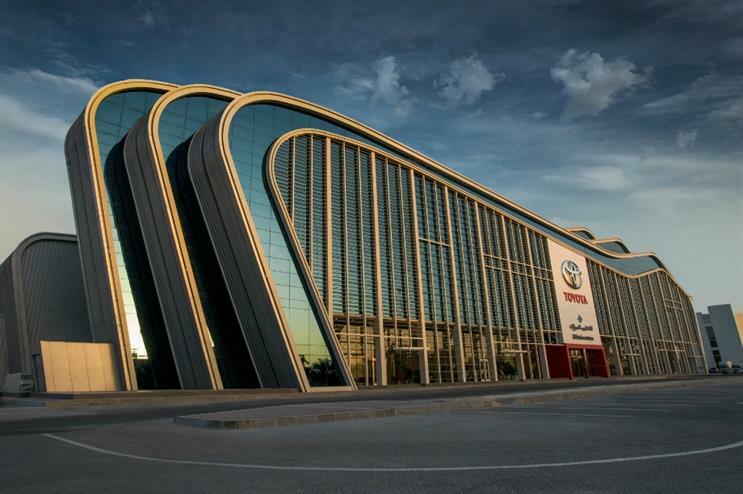 The Toyota flagship retail space has been devised and implemented by agency Greenspace, after being appointed by Al-Futtaim Motors, exclusive distributor of Toyota in the United Arab Emirates (UAE), in 2014. The store intends to fully immerse Toyota customers in the brand. Guests will be able to experience forms of physical and digital interaction within the extensive space, which covers 9,500m2, and spans four floors. Visitors will have access to the Toyota design studio, where they can specify their own vehicle accessories, colours and materials using physical and digital design tools; the 'Refuel' café, a relaxation space serving refreshments; the Toyota gallery, a heritage exhibition illustrating 60 years of Al-Futtaim and Toyota’s partnership in the UAE, and the Toyota play space, kitted out with electric cars for children to play with while supervised by parents. The space will also feature 3D printers, Toyota vehicle design drawing and modelling stations, and virtual reality headsets for guests to experience as they make their way around the store. Saud Abbasi, managing director of Toyota at Al-Futtaim Motors, said: "We are delighted with the dedicated work and progress Greenspace has achieved over the past two years, helping us materialise our customer-first vision and elevate our guests experience to new heights, through an ultra-modern, welcoming and seamless journey." Adrian Caddy, CEO and founder of Greenspace, said: "As a London-based company with a specialist reputation, we were delighted to be chosen by Al-Futtaim Motors and Toyota to create the new retail flagship experience in Abu Dhabi. This is a unique project with real ambition that will create a powerful legacy for all involved." Greenspace will continue to work with Al-Futtaim Motors and Toyota for a further five retail experiences for Lexus and Toyota in the UAE. The retail projects will include both commissioned new buildings and complete re-designs of existing sites. Initial work has commenced with completion of the projects happening within the next two years. Earlier this month, Toyota UK staged an immersive theatre performance at London's Printworks. Last month, Ford opened its new experience centre in New York.